Child's drawing of the tooth fairy. The tooth fairy is a fantasy figure of early childhood. The folklore states that when children lose one of their baby teeth, they should place it underneath their pillow and the tooth fairy will visit while they sleep, replacing the lost tooth with a small payment. The tradition of leaving a tooth under a pillow for the tooth fairy to collect is practiced in various countries in the Anglosphere. In early Europe, it was a tradition to bury baby teeth that fell out. When a child's sixth tooth falls out, it is a custom for parents to slip a gift or money from the tooth fairy under the child's pillow, but to leave the tooth as a reward. In northern Europe, there was also a tradition of tand-fé or tooth fee, which was paid when a child lost its first tooth. This tradition is recorded in writings as early as the Eddas, which are the earliest written record of Norse and Northern European traditions. The reward left varies by country, the family's economic status, amounts the child's peers report receiving and other factors. A 2013 survey by Visa Inc. found that American children receive $3.70 per tooth on average. During the Middle Ages, other superstitions arose surrounding children's teeth. In England, for example, children were instructed to burn their baby teeth in order to save the child from hardship in the afterlife. Children who didn't consign their baby teeth to the fire would spend eternity searching for them in the afterlife. The Vikings, it is said, paid children for their teeth. In the Norse culture, children's teeth and other articles belonging to children, were said to bring good luck in battle, and Scandinavian warriors hung children's teeth on a string around their necks. Fear of witches was another reason to bury or burn teeth. In medieval Europe, it was thought that if a witch were to get hold of one of your teeth, it could lead to them having total power over you. Unlike Santa Claus and, to a lesser extent, the Easter Bunny, there are few details of the tooth fairy's appearance that are consistent in various versions of the myth. A 1984 study conducted by Rosemary Wells revealed that most, 74 percent of those surveyed, believed the tooth fairy to be female, while 12 percent believed the tooth fairy to be neither male nor female and 8 percent believed the tooth fairy could be either male or female. When asked about her findings regarding the tooth fairy's appearance, Wells explained - "You've got your basic Tinkerbell-type tooth fairy with the wings, wand, a little older and whatnot. Then you have some people who think of the tooth fairy as a man, or a bunny rabbit or a mouse." One review of published children's books and popular artwork found the tooth fairy to also be depicted as a child with wings, a pixie, a dragon, a blue mother-figure, a flying ballerina, two little old men, a dental hygienist, a potbellied flying man smoking a cigar, a bat, a bear and others. Unlike the well-established imagining of Santa Claus, differences in renderings of the tooth fairy are not as upsetting to children. Belief in the tooth fairy is viewed in two very different ways. On the one hand, children believing is seen as part of the trusting nature of childhood. Conversely, belief in the tooth fairy is frequently used to label adults as being too trusting and ready to believe anything. 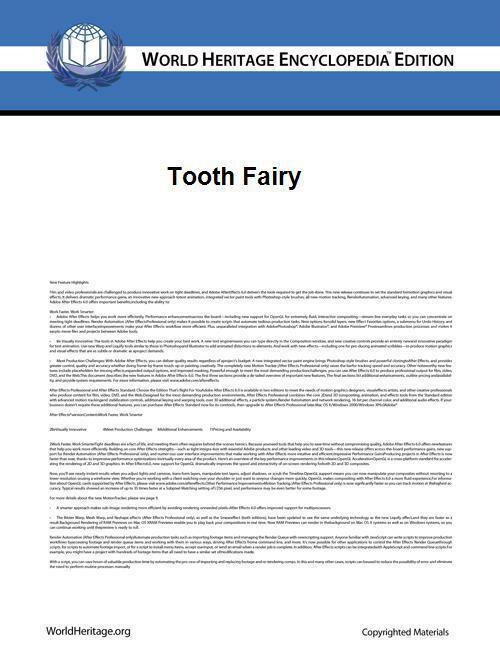 While parents are often unsure of themselves when promoting the fiction of the tooth fairy, the majority of children report positive outcomes. Upon learning the tooth fairy is not real, 75% of children reported liking the custom; 20% were neutral and 3% were not in favor and said they did not intend to continue the practice when they became parents. Parents tend to view the myth as providing comfort for children in the loss of their tooth. Research finds that belief in the tooth fairy may provide such comfort to a child experiencing fear or pain resulting from the loss of a tooth. Mothers especially seem to value a child's belief as a sign that their "baby" is still a child and is not "growing up too soon". By encouraging belief in a fictional character, parents allow themselves to be comforted that their child still believes in fantasy and is not yet "grown up". 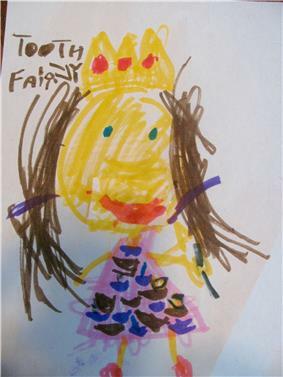 Children often discover the tooth fairy is imaginary as part of the 5- to 7-year shift, often connecting this to other gift-bearing imaginary figures (such as Santa Claus and the Easter Bunny). Author Vicki Lansky advises parents to tell their children early that the tooth fairy pays a whole lot more for a perfect tooth than for a decayed one. According to Lansky, some families leave a note with the payment, praising the child for good dental habits. Research findings suggest a possible relationship between a child's continued belief in the tooth fairy (and other fictional characters) and false memory syndrome. The Ratoncito Pérez (or Ratón Pérez, "Pérez Mouse" in English) is a figure popular in Spanish and Hispanic American cultures, similar to the tooth fairy, originating in Madrid in 1894. As is traditional in some English-speaking countries, when a child loses a tooth it is customary for him or her to place it under the pillow, so that Ratoncito Pérez will exchange it for a gift. The tradition is almost universal in Spanish cultures, but takes different forms in different areas. He is known as "Ratoncito Pérez" in Spanish speaking countries, with the exception of some regions of Mexico, Peru and Chile, where he is called "el Ratón de los Dientes" (The Tooth Mouse), and in Argentina, Venezuela, Uruguay and Colombia, he is known simply as "El Ratón Pérez". The Ratoncito Pérez was used by Colgate marketing in Venezuela and Spain. In Italy, the tooth fairy is also often replaced by a small mouse. In France and in French-speaking Belgium, this character is called la petite souris ("the little mouse"). From parts of Lowland Scotland comes a tradition similar to the fairy mouse: a white fairy rat who purchases children's teeth with coins. In Japan, a different variation calls for lost upper teeth to be thrown straight down to the ground and lower teeth straight up into the air; the idea is that incoming teeth will grow in straight. In Middle Eastern countries (including Iraq, Jordan, Egypt and Sudan), there is a tradition of throwing a baby tooth up into the sky to the sun or to Allah. This tradition may originate in a pre-Islamic offering, and dates back to at least the 13th century. It is also mentioned by Izz bin Hibat Allah Al Hadid in the 13th century. The term has been applied to studies into biologically implausible treatments such as acupuncture and homeopathy. ^ Blair, John R.; McKee, Judy S.; Jernigan, Louise F., Psychological Reports, Vol 46(3, Pt 1), June 1980. "Children's belief in Santa Claus, Easter Bunny and Tooth Fairy". pp 691–694. ^ An Icelandic-English Dictionary first edition available on tannfés.v. ^ Hedges, Helen, Joy Cullen. Australian Journal of Early Childhood, Vol. 28, 2003. "The Tooth Fairy Comes, or Is It Just Your Mum and Dad? : A Child's Construction of Knowledge". pp 19-24. ^ "Tooth fairy," Merriam-Webster.com, 2015 (viewed 15 June 2015). ^ a b c d e Wells, Rosemary. "The Making of an Icon: The Tooth Fairy in North American Folklore and Popular Culture" in The Good People: New Fairylore Essays. Peter Narváez ed., 1997. pp 426-446. University Press of Kentucky. ^ a b Clark, Cindy Dell. "Flight Toward Maturity: The Tooth Fairy" in Flights of Fancy, Leaps of Faith: Children's Myths in Contemporary America. University of Chicago Press, 1995. pp 355-364. ^ Sameroff, Arnold and Susan C. Mcdonough. Phi Delta Kappan, Vol. 76, 1994, "Educational implications of developmental transitions: revisiting the 5- to 7-year shift". ^ Principe1, Gabrielle F. and Eric Smith. Applied Cognitive Psychology, Volume 22, Issue 5, pages 625–642, July 2008. "The tooth, the whole tooth and nothing but the tooth: how belief in the Tooth Fairy can engender false memories". ^ ¡Producto Registrado! : Agosto 1998: Centuria Dental. ^ Al Hamdani, Muwaffak and Wenzel, Marian. "The Worm in the Tooth", Folklore, 1966, vol. 77, pp. 60-64. Lainez, Rene Colato (2010). The Tooth Fairy Meets El Raton Perez. Illustrated by Tom Lintern. ISBN 978-1-58246-296-7. Narváez, Peter (1997) The Good People: New Fairylore Essays. (section V) University Press of Kentucky. Wynbrandt, James (1998). The Excruciating History of Dentistry. St. Martin's Press. ISBN 0-312-26319-8.